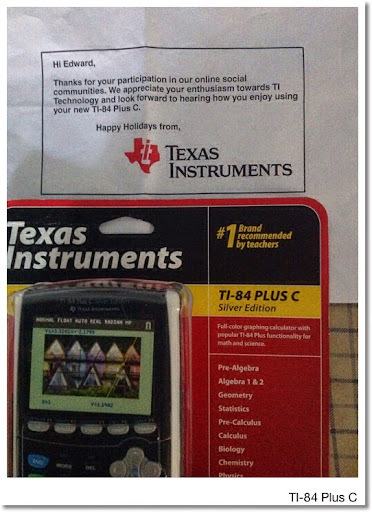 My first graphing calculator was a TI-81, which I still have and it's working. I think I currently have four of the TI-84 family (83+ Silver, 84+, and two 84 color editions). 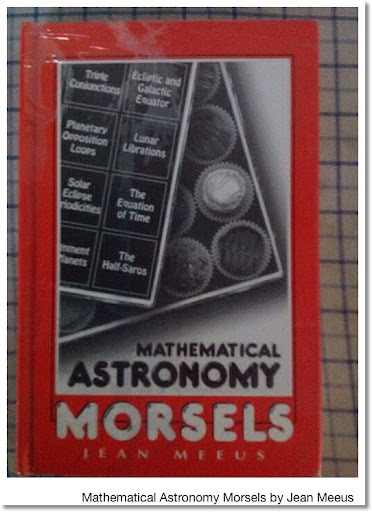 My Amazon order came in last week: "Mathematical Astronomy Morsels" by Jean Meeus. It can shrink wrapped, which is nice. I found out that Meeus calculated how long the Age of Pisces was going to last (until 2597). Here, the definition of age is determined the placement of the vernal equinox. Thanks Agena Astroproducts for quick delivery. Just wanted to show you some of the goodies. 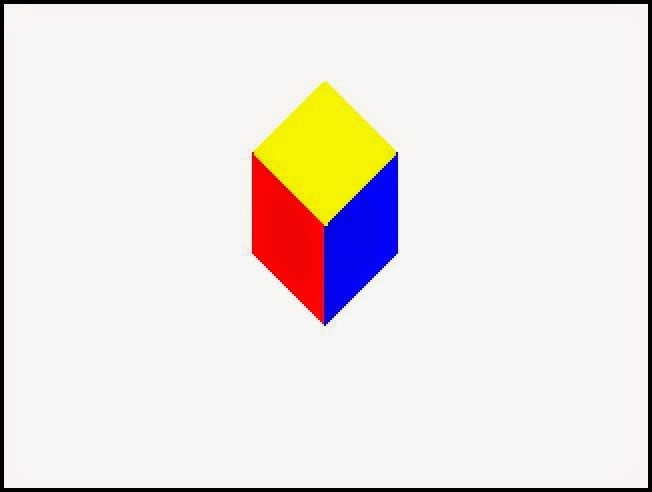 DRAW3DCUBE: 3D Cube - not as easy as it seems. DRAW3DCYN: My first one I did this weekend. This looks like a tall glass of water. 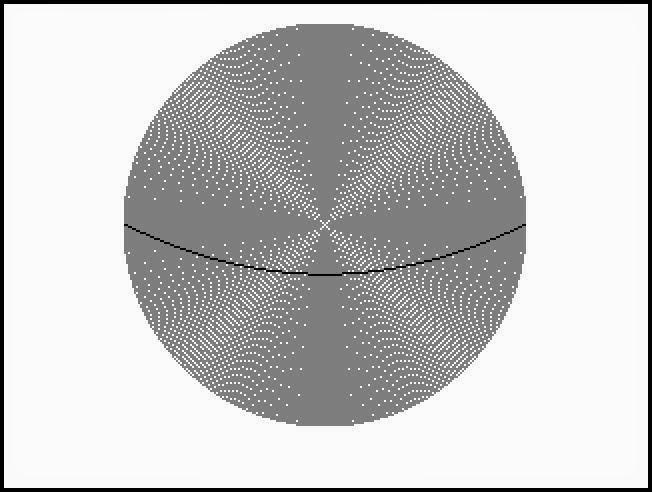 DRAW3DSPH: Sphere. I like the effect the HP Prime does with ARC in a FOR loop. 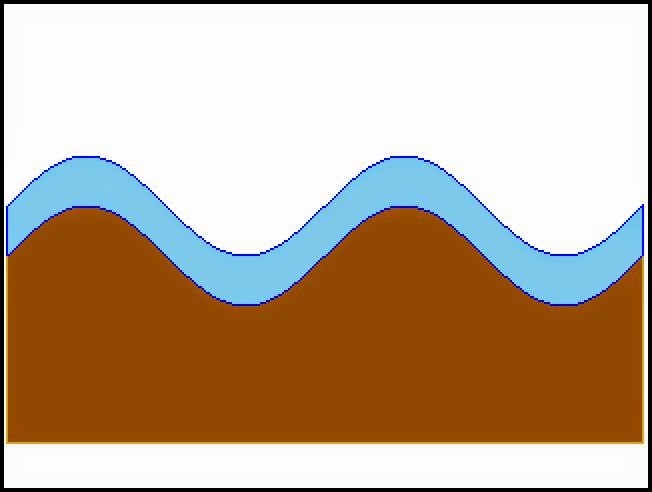 DRAW3DWAVE: I wanted something to be drawn using a sine wave. 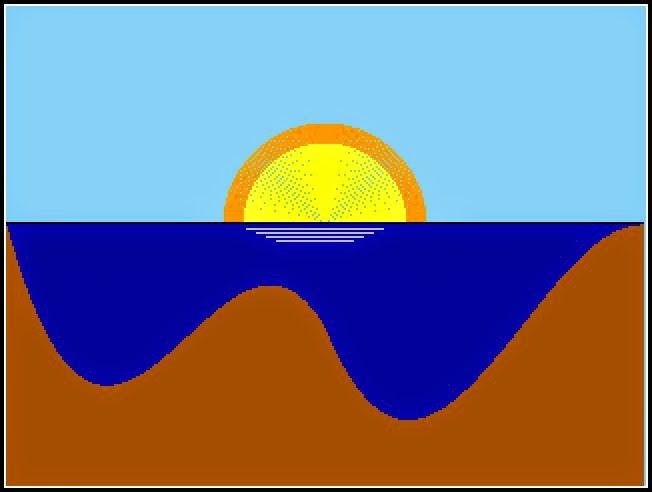 DRAWSUNSET - This is probably my favorite, since I like sunsets. Tip: The HP Prime screen is 318 pixels wide and 240 pixels deep. If you want to leave room for custom menus, then the canvas is 318 pixels by 218 pixels. The x axis increases to the right, but unlike the Cartesian plane, the y axis increases downward instead of upward. This allows the user to calculate n! for any positive n, even n > 69. D = days after March 21. A 365 day year is assumed. "ANOTHER PT.?" // are you done? See you all next time - have a great weekend! Go have some fun! 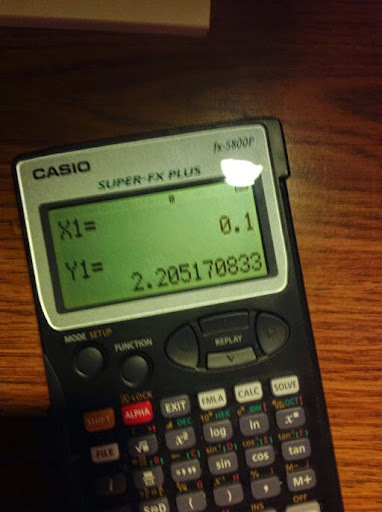 Here is a short tutorial on how to create a custom formula for the Casio fx-5800p. The fx-5800p has a library of 128 formulas ranging in various topics from geometry to physics and engineering. 4. Give a name, no more than 12 letters or numbers. Symbols are not allowed. 5. At the File Mode screen, select 3 for Formula. 6. Type your formula. Use the y=f(x) format. 7. When you are done, press the [ EXIT ] key. Tip: You can use lower case letters, Greek letters, and stylized letters in the formula. Press [ FUNCTION ], then 4 for ALPHA to get access to these characters. Remember: Variables are one character length. The fx-5800p will execute implied multiplication when it executes two more consecutive variables. 2. Press the [ FMLA ] button. Select 1 for the Original type. 4. Use the arrow keys to enter values or scroll the formula. 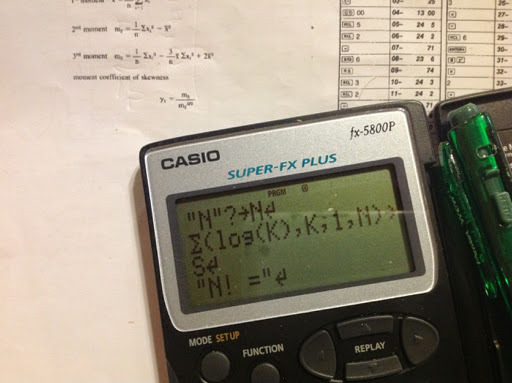 When you are ready to compute, press [ CALC ]. And that is about all there is to regarding creating and calculating formulas on the Casio fx-5800p. Program LSQ (least squares) for the Casio fx-5800p. The program LSQ (least squares) allows us to fit a polynomial or a multiple-linear regression line given certain data and outcomes. Mat C = coefficient matrix. This is the matrix LSQ solves for. Note that the equation has a constant term c. Set up our matrix A with three columns: one corresponding to the term a * x1, the second for the term b * x2, and a column of ones for the constant column c.
Matrix B will have the dependent values, in this case a 5 x 1 matrix. With the matrices set up, run LSQ. You can enter the required matrices manually (with [ ALPHA ] [ ln ] for the left bracket, [ ALPHA ] [ x^ ] for the right bracket) or used pre-stored matrices. The fx-5800p has room for only six matrices (Mat A - Mat F). We have one variable. However the equation has both x and x^2. Hence, we will set up matrix A as follows: first column has x^2 values, second has x values, and third column contains ones because it corresponds to the constant term (c). Even though the least-squares method isn't perfect, it is super powerful. Until next time, have a great day, stay healthy, and stave off any viruses because they have gone crazy this winter! The program RK4 uses a subroutine FXY. The program FXY is where the y'(x) is stored in terms of X and Y. The result is stored in the variable Z. Remember for the fx-5800p, all variables (A-Z, and Z[#]s) are global, meaning they will carry over from programs and subroutines. Anything following the double slash (//) is a comment. Once the first point (x_n+1, y_n+1) is calculated, RK4 will ask if you want the next point (x_n+2, y_n+2) calculated. Enter 1 at the prompt for "Yes". // A RETURN command is implicit. "1 = YES 0 = NO"
Example: y'(x) = y - x with the initial condition (0,2). Find y when x = 0.1 and x = 0.2, respectively. In this case, our step is h = 0.1. The program BISECT finds a root for f(X) given an initial open interval of (A, B). I have the tolerance set to 10^-9. To prevent calculations from going "forever", I set the maximum number of iterations to 150. You can adjust these factors in the program as desired. The first point to be tested is (A+B)/2. 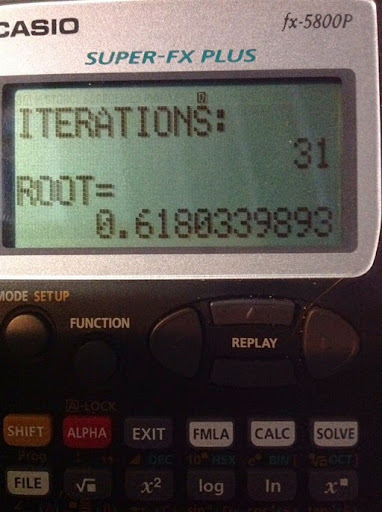 If this is a root, the program stops and it will return this root as a result. The program BISECT calls on a subroutine program FX. The function f(X) is stored in FX. Prog "name of subroutine in quotes"
// A Return command is implied. f(X) = X^(3)-2X+1, for the intervals (-2,0), (0,2), and (0,1). The above link provides files for the calculator, connectivity kit, and emulator. 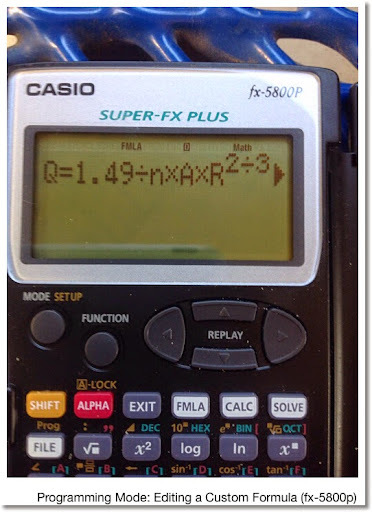 Here a great place to discuss calculators, specifically HP calculators. It is a really great place for HP calculator owners. The link to the forum is here: http://www.hpmuseum.org/forum/. DISCLAIMER: I am not an employee of Hewlett Packard. Happy New Year! Time flies when we are having fun - we are in 2015 - 15 years into the 21st century. Here's to making 2015 happy and prosperous for all! Without further ado, here are the first programs for 2015! Hsai-Yang Fang. “Foundation Engineering Handbook” Springer Science & Business Media. 1990.